Ramez Helles, 16, was shot and killed near the Karni crossing between Gaza and Israel.Witnesses and medics said that the child was hit directly with live rounds and died in the spot. 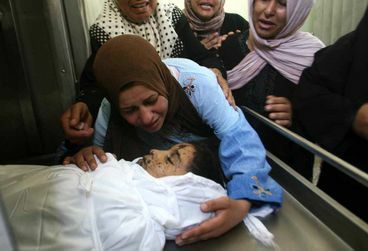 Israel　always report untrue reason after killing Palestine innocent children. major media broadcast only from Israeli army imformation and often they changed truth to story that in the fight of Israeli army and terrorist,some terrorists were killed. Palestine children often says that "We are not terrorist..! Why do they kill my friends and world let do so?" They shot in the air? Yeah right! They make any excuse to justify their actions.